Age-related macular degeneration (AMD) is the leading cause of blindness in the industrialized world, affecting 1.75 million people in the United States alone.1 Dry AMD can progress to wet or neovascular AMD, in which submacular hemorrhages are relatively uncommon but represent an important subset of patients who may present with severe visual loss. In this case series, four patients with wet AMD and submacular hemorrhage were treated with serial intravitreal injections of ranibizumab. Baseline best-corrected visual acuity (BCVA) was 20/60 or worse in all patients. Over the course of 4 to 8 months, the hemorrhages resolved, and final BCVA was between 20/25 and 20/40. An 85 year-old woman with a history of dry AMD in both eyes developed sudden onset decreased vision in the left eye, with a BCVA on presentation of 20/60. 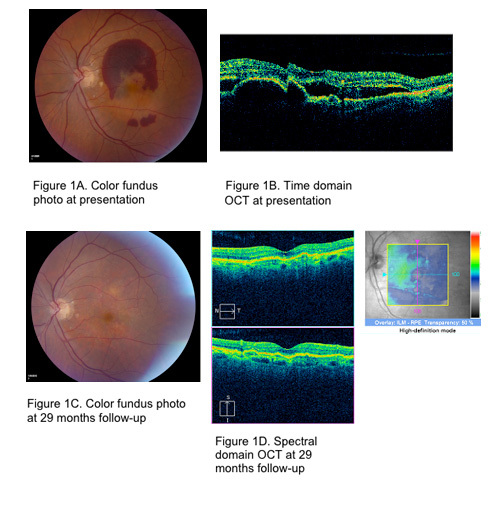 Clinical examination demonstrated a choroidal neovascular membrane (CNVM) with a submacular hemorrhage in the left eye (Figure 1A); OCT demonstrated a pigment epithelial detachment (PED), subretinal fluid, and cystoid macular edema (Figure 1B). The patient underwent treatment with intravitreal ranibizumab (0.5mg/0.05ml) in the left eye every four to six weeks. After eight months, the patient had received a total of six injections of ranibizumab. The subretinal hemorrhage gradually resolved and BCVA improved to 20/20. By 29 months after presentation with the subretinal hemorrhage, the patient has undergone five additional injections of ranibizumab, she continues to be free of hemorrhage and intraretinal fluid on OCT (Figures 1C, 1D), and her BCVA is 20/30. An 83 year-old man with a history of dry AMD in the right eye and wet AMD in the left eye was referred for one month of persistent, decreased visual acuity in the left eye, with a BCVA of 20/400. Clinical examination, fundus photography, and fluorescein angiography demonstrated a subretinal hemorrhage superior to the fovea, associated with a classic subfoveal CNVM (Figure 2A). 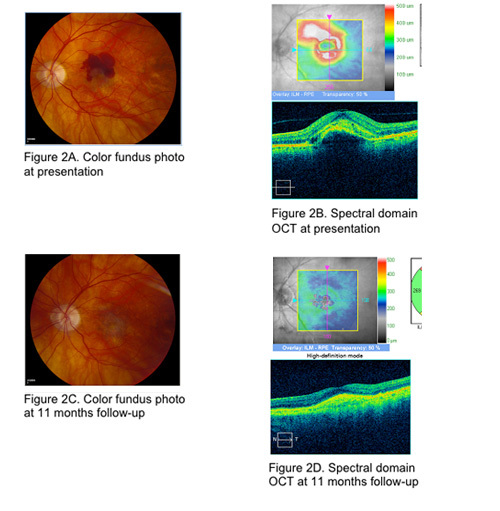 OCT demonstrated subretinal blood, subretinal fluid, intraretinal edema, and a PED (Figure 2B). The patient underwent monthly injections of ranibizumab, and the hemorrhage gradually resolved. By 11 months follow-up, the patient has received 11 monthly injections of ranibizumab, examination demonstrates no hemorrhage (Figures 2C, 2D), and the BCVA is 20/30. A 63 year-old woman with a history of dry AMD in the right eye and wet AMD in the left eye was referred for two weeks of decreased vision with a large black scotoma in her left eye. BCVA in the left eye was 20/200. 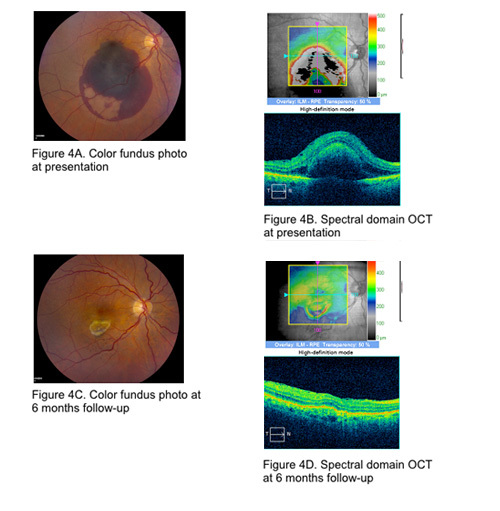 Clinical examination demonstrated subretinal hemorrhage (Figure 3A), and OCT demonstrated hemorrhage under the retina and under the retinal pigment epithelium (RPE) with no significant intraretinal or subretinal fluid (Figure 3B). Intravitreal ranibizumab was administered on a monthly basis, and the patient's vision improved to 20/60 after only two injections of ranibizumab. By five months after presentation, the patient has received five monthly injections of ranibizumab, the hemorrhage has resolved, as have the sub-RPE densities on OCT (Figures 3C, 3D), and the final BCVA is 20/25-2. An 82 year-old woman with a history of wet AMD in the right eye, for which she had been treated with three intravitreal injections of ranibizumab, developed a sudden loss of central vision in the right eye. BCVA was 20/60 and clinical examination demonstrated a large submacular hemorrhage (Figure 4A). OCT confirmed the subretinal hemorrhage and also revealed minimal intraretinal and subretinal fluid (Figure 4B). The patient was treated with monthly intravitreal injections of ranibizumab. By seven months follow up, the patient has received six injections of ranibizumab, the subretinal hemorrhage is resolved, leaving a gliotic scar inferior to the fovea (Figure 4C), there is minimal intraretinal and subretinal fluid observed on OCT (Figure 4D), and the BCVA is 20/30. Subretinal hemorrhages have been reported to occur with a 17% incidence in patients with wet AMD.2 If left untreated, 80% of patients may experience deterioration in visual acuity.3 The poor visual outcomes have been attributed to disciform scarring, recurrent hemorrhage, impedance of nutrient exchange across the retina, traction from fibrin strands in the blood clots, or iron toxicity from whole blood.3 AMD is associated with worse visual outcomes than other etiologies of subretinal hemorrhage such as traumatic choroidal ruptures or POHS.3 This may be due to the generalized dysfunction of Bruch's membrane and RPE in AMD or from the natural progression of the disease itself. Management options for submacular hemorrhage include observation, surgical removal of the clot with subretinal forceps, subretinal injection of tissue plasminogen activator (tPA), intravitreal or subretinal tPA with pneumatic displacement, and anti-vascular endothelial growth factor (anti-VEGF) antibodies, as presented in our series. In the era of anti-VEGF therapy, surgery is rarely recommended,7 and good visual outcomes may be associated with anti-VEGF therapy. A previously published study of 21 eyes found that bevacizumab was associated with resolution of submacular hemorrhages with no serious complications.8 Another study conducted with ranibizumab found that the visual acuities of 7 of 11 treated eyes improved or stabilized.9 Our results support these findings. In the four patients presented in our case series, the decision was made to allow the hemorrhage to resolve without surgical manipulation, and to treat the underlying etiology of the hemorrhage (CNVM associated with AMD) with monthly intravitreal injections of ranibizumab. All of the patients began to experience improvement in BCVA within three months of treatment, with a reduction in the amount of subretinal fluid on OCT within five months. Three of the four patients achieved visual acuities greater than 20/40 within four months. The fourth patient's large hemorrhage and complicated ocular history slowed the recovery process, but she achieved excellent visual acuity (20/30) by six months. 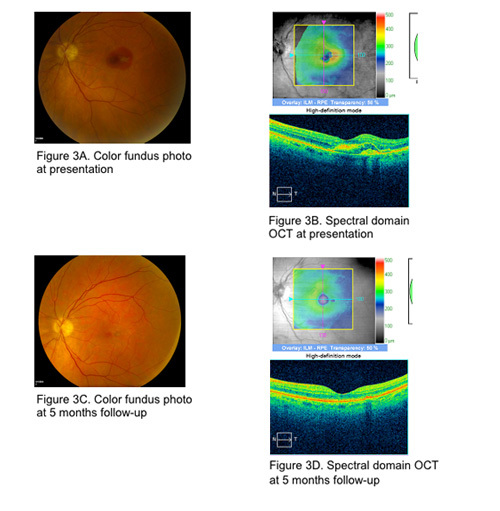 In a recent report of 12 eyes in which ranibizumab monotherapy was administered for subfoveal hemorrhage secondary to AMD, the mean time for complete clearance of subretinal hemorrhage was 4.7 months (with a range of 3-7 months).10 None of our patients experienced a recurrence of hemorrhage. There were also no significant local or systemic side effects from the anti-VEGF medication. Although submacular hemorrhage in the setting of AMD may be associated with poor visual outcomes, some patients may be able to achieve improvement in vision over time with medical management, as described in this report. Further studies are necessary to determine the optimal dosing regimen. Congdon N, O'Colmain B, Klaver CC, Klein R, MuÃ±oz B, Friedman DS, Kempen J, Taylor HR, Mitchell P; Eye Diseases Prevalence Research Group. Causes and prevalence of visual impairment among adults in the United States. Arch Ophthalmol 2004;122(4):477-85. Poliner LS, Olk RJ, Burgess D, Gordon ME. Natural history of retinal pigment epithelial detachments in age-related macular degeneration. Ophthalmology 1986; 93: 543-51. Scupola A, Coscas G, Soubrane G, Balestrazzi E. Natural history of macular subretinal hemorrhage in age-related macular degeneration. Ophthalmologica 1999;213(2):97-102. Childs AL, Bressler NM, Bass EB, Hawkins BS, Mangione CM, Marsh MJ, Miskala PH; Submacular Surgery Trials (SST) Research Group. Surgery for hemorrhagic choroidal neovascular lesions of age-related macular degeneration: quality-of-life findings: SST report no. 14. Ophthalmology. 2004 Nov;111(11):2007-14. Submacular Surgery Trials (SST) Research Group. Surgery for hemorrhagic choroidal neovascular lesions of age-related macular degeneration: ophthalmic findings. Ophthalmology 2004 Nov;111:1993-2006. Hillenkamp J, Surguch V, Framme C, Gabel VP, Sachs HG. Management of submacular hemorrhage with intravitreal versus subretinal injection of recombinant tissue plasminogen activator. Graefes Arch Clin Exp Ophthalmol. 2010;248(1):5-11. Flynn HW, Scott IU. Now that we have the results of the Subretinal Surgery Trials, how do we manage the patient? Arch Ophthalmol 2004; 122:1705-1706. Olivier S, Chow DR, Packo KH, MacCumber MW, Awh CC. Subretinal recombinant tissue plasminogen activator injection and pneumatic displacement of thick submacular hemorrhage in age-related macular degeneration. Ophthalmology 2004;111(6):1201-8. Stifter C, Michels S, Prager F, Georgopoulos M, Polak K, Hirn C, Schmidt-Erfurth U. Intravitreal bevacizumab therapy for neovascular age-related macular degeneration with large submacular hemorrhage. Am J Ophthalmol 2007;144(6):886-892. McKibbin M, Papastefanou V, Matthews B, Cook H, Downey L. Ranibizumab monotherapy for sub-foveal hemorrhage secondary to choroidal neovascularization in age-related macular degeneration. Eye (Lond) 2009 Nov 13.